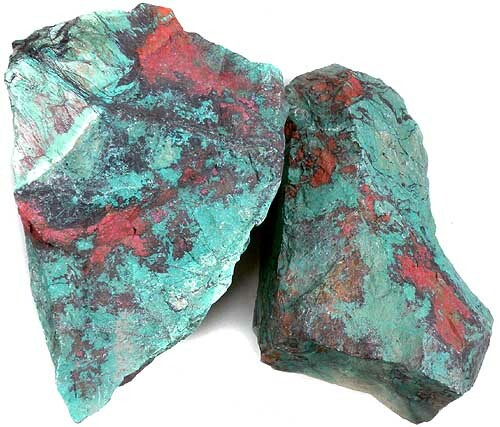 A rare material sometimes referred to as Christmas Stone because of the green and red coloring. 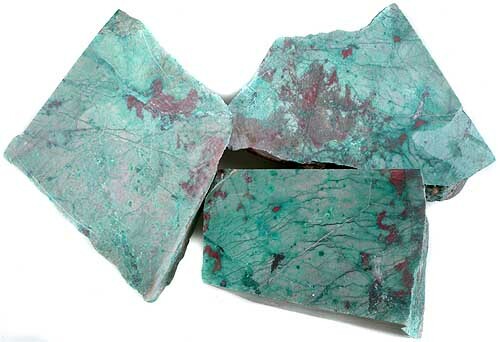 Although Sonoran Sunrise is often referred to as chrysocolla, the greenish area is actually bronchantite. The red-orange area is the chalcotrichite form of cuprite. The black area is usually the copper oxide tenorite and on occasion, there is a purplish-gray area that is cuprite. These copper secondaries impregnated a host rock of limestone, which makes Sonoran Sunrise a great lapidary material that is easy to cut and polish. See the description of each stone below for the coloration of that individual piece. Sonoran Sunrise polishes well with tin oxide or diamond. Mohs hardness is approximately 3-4. 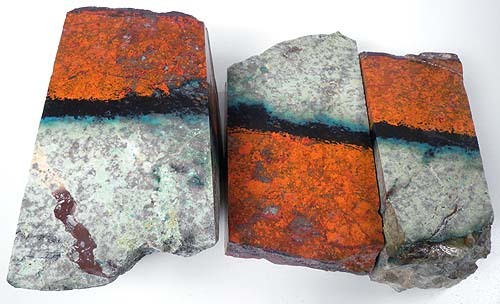 This material has reddish cuprite with mottled light green and a strong vein of black with a darker green line. Measures approximately 5" x 3" x 3 to 1" thick. Half red with a thick line of black, followed by an 1/8" line of green with the rest mostly being a mottled light green. Measures approximately 6 to 4-1/2" x 3" x 1-3/4 to 1-5/8" thick. Half red with a thick line of black, followed by an 1/8" line of green with the rest mostly being a mottled light green. Measures approximately 5" x 2-3/8 to 2" x 2 to 1-5/8" thick. Half red with a thick line of black, followed by an 1/8" line of green with the rest mostly being a mottled light green. Measures approximately 4-3/4 x 2 to 1" x 7/8 to 1/4" thick. Mostly very light green with red mottling with some black tenorite and green separating the red chalcotrichite. Triangular shape measures approximately 6" x 3-3/4" x 2-1/2" at the thickest spot. Mostly red with a wide black and green separating it from very light green with red mottling. Measures approximately 5 x 4-1/2" x 4-1/2" thick. Half mostly green and half mostly red with a smattering of green. 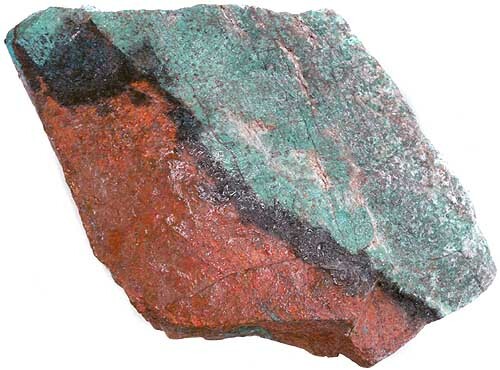 A black border of tenorite divides the red and green. Super nice slabber!! Measures approximately 4" x 3" x 1-3/4 to 7/8" thick. Mostly red with a wide band of black and green. This material is mostly reddish cuprite, but may have some veining of black and/or green. This material is the highest quality Sonoran Sunrise. It has a nice mix of the three colors (greenish, reddish and black) in a tighter pattern. Triangular shape measures approximately 4-1/4" x 3" x 2-1/2" thick tapering down to a point. Mostly green with splatters of red. There is some black along one edge or the stone. Measures approximately 6 x 4-3/4" x 4-1/2 to 1" thick. Nice figuring with a mix of green, red and black. This will cut great slabs!! 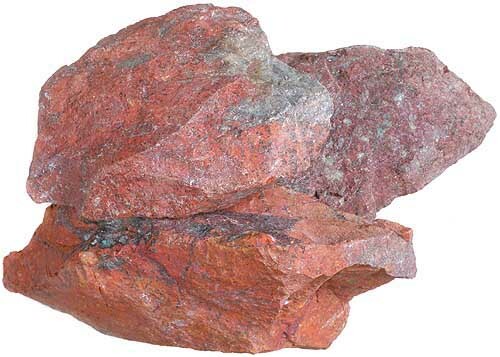 This material will have nice red cuprite mixed in with a medium-ligh greenish background, or mostly red with some black and green coloring. Measures approximately 3-1/2" x 3-1/4" x 2-1/4" thick. Nice red splotches on a green to light green background. Triangular shape measures approximately 5" x 3" x 3-3/8 to 2-3/4" thick. A smattering of red splotches with some black spiderwebbing on a light mottled light green background. Triangular shape measures approximately 5" x 3-1/4" x 2-1/4" thick. Red splotches with some black spiderwebbing on a medium to light mottled light green background.